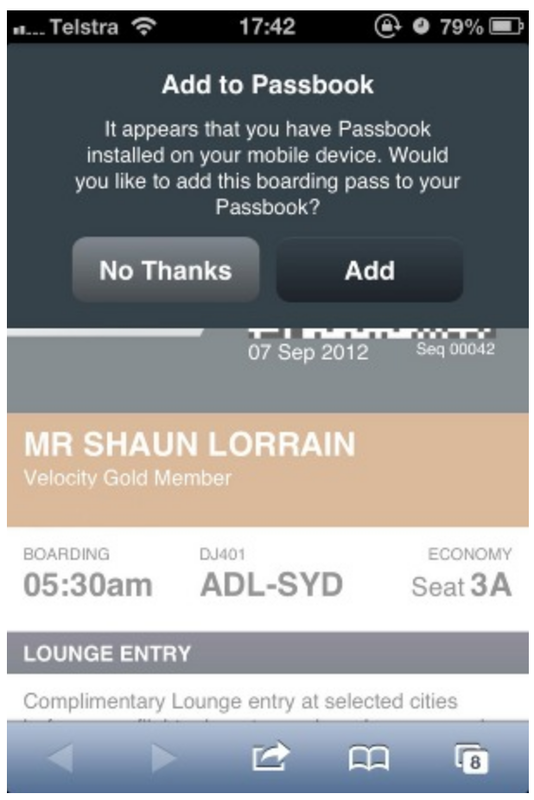 AusBT reader Shaun Lorrain checked in for a Virgin Australia flight using the airline’s mobile website on his iPhone, which is running a developer preview edition of iOS 6 – and this is what he saw…. Yes, iOS 6 detected the mobile checkin and offered to save the boarding pass into Shaun’s Passbook account…Passbook also offers live updates to these e-passes, such as flight delays and changes to the airport boarding gate…United Airlines has already committed to supporting Passbook with its own mobile boarding passes, and other airlines won’t be slow to jump onto that bandwagon. Interestingly, this popup message is not actually coming from iOS itself, but rather from the airline’s website, which has detected iOS 6 as the phone’s operating system. This means, at any time over the next few days, other airlines and businesses could start adding Passbook support to their websites too. The web is not curated like the App Store, so these updates can roll out without approval from Apple. If you spot other websites updating to support Passbook, be sure to tip us at tips@9to5mac.com.